National Cherry Month and Valentine’s Day; What Could be Sweeter? We all know Valentine’s Day is in February, but did you also know that February is National Cherry Month? A delicious combination, right? 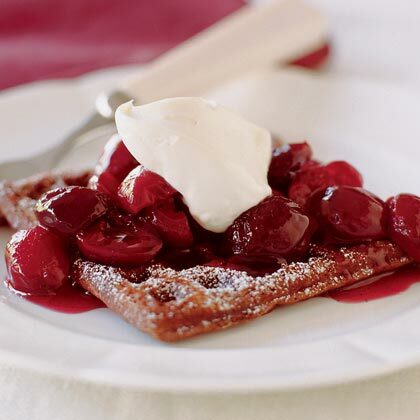 What could be sweeter than a delectable dish made with luscious, ripe, mouth-watering cherries? We tried, and we can’t think of anything better, so we decided to share some of the most delicious recipes we could find. Start the morning off right with some cherry-topped waffles and finish the evening with a to-die-for dark chocolate tart topped with cherries and almond whipped cream. Whether it’s Valentines Day or just a regular weekday or weekend, you’ll turn it into a special occasion with any one of these amazing dishes as you share the love and celebrate National Cherry Month. From our friends at Sunset Magazine comes the first out-of-this-world cherry recipe. What goes better with cherries than chocolate? You’re right, that’s a trick question, because the answer is nothing! Eyes will pop open and feet will be running to the breakfast table for this yummy breakfast. Next up, an amazing appetizer you’ll want to bring to every party for the rest of the year! Thank you, Gastronom blog! Stir until brown sugar is dissolved and cherries are coated and allow to sit for 1 hour. Slice the baguette into 1/2 inch thick slices, brush with olive oil, and season with salt and pepper. 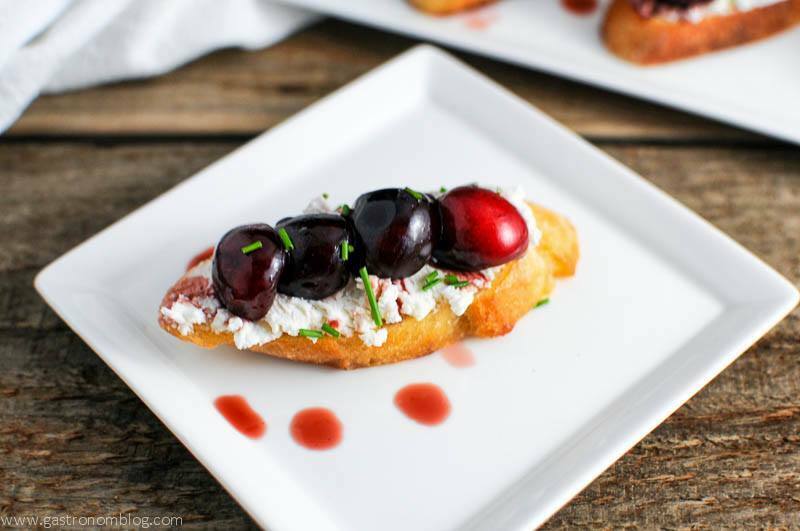 Spread goat cheese onto slices, top with cherries, and drizzle with some of the cherry balsamic liquid. Finish by topping crostini with chopped chives. Advance preparation: You can have the salad and the dressing prepared a few hours ahead, but don’t toss until just before serving. If you’re staying in with your significant other this year, why not try this marvelous main dish for your at-home Valentine’s Day feast from Champagne Tastes. It’s a recipe for romance when you make this almond cherry seared salmon you might even swim across the ocean for. Pat salmon dry. Pat dry again. (Wet fish will not sear). Sprinkle both sides with salt and pepper and rub the lemon zest onto the fleshy side of the salmon. Use thin metal spatula to flip salmon. If salmon sticks to the pan, allow it to cook another 30 seconds and try again until it’s loosened. Once salmon is flipped, sear it for about 1 minute. Remove salmon from pan and cover it with a paper towel to keep it hot. Turn heat down to medium. Carefully add amaretto to the pan. Next, add cherries and the reserved lemon juice. Simmer cherries for about 2 minutes. While cherries sear, smash them with the back of a spoon to release juices. When it’s time for dessert, nothing says “I love you” quite like dark chocolate. 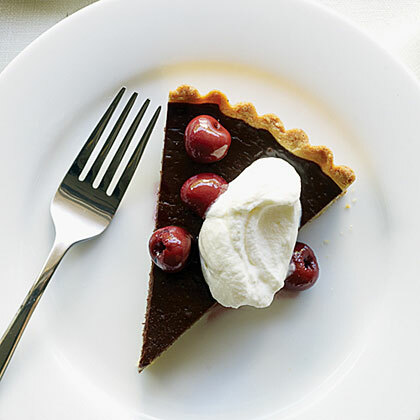 For a finish that will leave you breathlessly satisfied, try this sinfully delicious dark chocolate tart recipe from Sunset Magazine. There you have it, from breakfast through dessert, cherry recipes that will have them beating down your door for more. Celebrate love and cherries this February in honor of National Cherry Month, and have a great Valentine’s Day!